The first ever person to describe the clouded leopard was Sir Stamford Raffles. However, Griffith was the first person to give this creature a scientific name. The elusive animal is rarely seen. If you speak to anyone who has seen the animal, they’d describe it as having the skull and definition of the big cats, but having the body of a smaller cat. The adult clouded leopard will be the size of a small leopard; and will have a longer body and tail, when compared to the short legs. The coat is generally said to be rich yellowish in color or could be an earthy brown. The name of this animal comes from the blotchy cloudlike marks that cover its body. Their long tails help as counterbalances when these animals have to climb trees. Although these leopards look similar to the marbled cat, their skulls are narrower and longer. The flexible vocal cords present indicate that, like the smaller cats, these animals also possess the ability to purr. The ankle joints on this animal are said to exhibit a lot of flexibility. This is said to be essential for these cats that are known as tree cats by the Malaysians. The eyes of these leopards are distinctive, given the fact that the pupils are, in reality, vertically oblong; and they aren’t round like other cats. 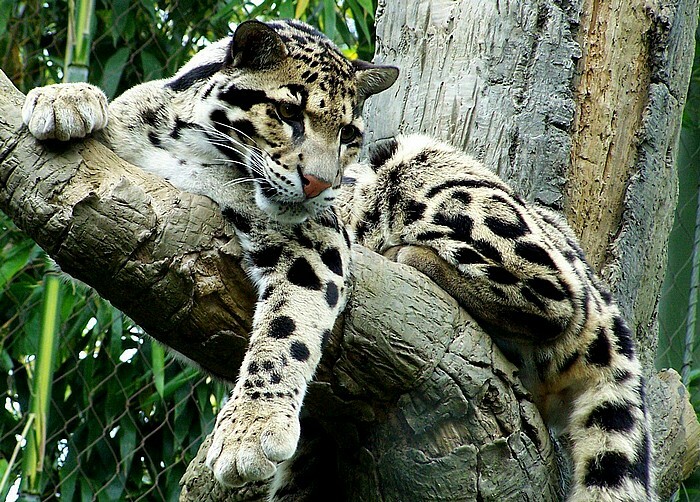 Clouded leopards are found in tropical forests, and can be seen up to the altitudes of about 2500 meters. They will generally survive in regions with marginal scrub, and they will be selectively logged forests that could be considered secondary. The common pockets to find these animals would be the region of South East Asia – Nepal, Southern China, Malaysia, Bhutan, Sumatra and Borneo. Traces of the animal in Taiwan suggest that it may have lived there, but may have been hunted until extinction. Just like other cats, the clouded leopard is an opportunistic predator. The prey that has been recorded in the past would include bearded pig, domestic cattle, porcupines, gibbons, chickens, monkeys, fish, sambar and such animals. If these leopards are being brought up in captivity, they will live on eggs and some other such vegetation. Most of the litters of the clouded leopards would have two cubs. However, in the case of litters born in captivity, up to 5 cubs have been born. Gestation period would be about 109 days. The cubs will be weaned in 93 days. Around the time of the 12th day, their eyes will open and they will begin walking by the time they’re 20 days old. The males will end up developing faster than their female counterparts and will begin achieving their c0loration by the time they’re six months old or so.